The Union of the Comoros is a country in southern Africa. The major seaports are Moroni (capital) and Mutsamudu. Comoros is a country comprising a group of islands in the Indian Ocean. 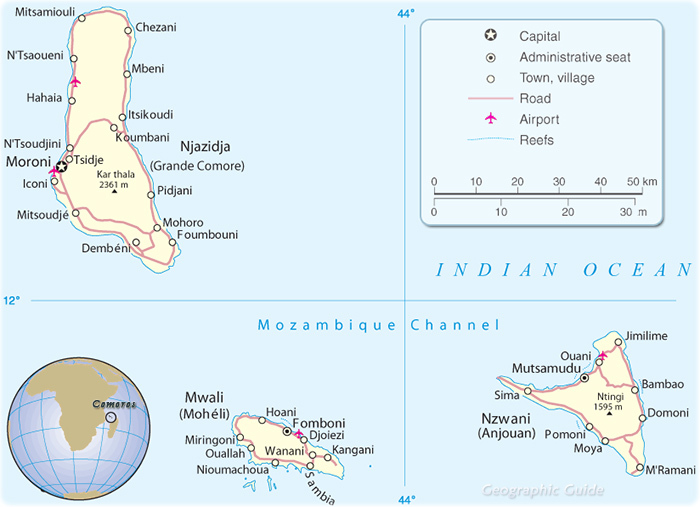 Located at the northern end of the Mozambique Channel, the islands lie about 290 km from Mozambique and about 320 km from Madagascar. Comoros has been a self-governing state since 1975 when three of the four islands of the Comoros archipelago broke away from French rule. The three islands are Njazidja (also called Grande Comore), Nzwani (Anjouan) and Mwali (Mohéli). The capital city, Moroni, is located on Njazidja. Comoros claims sovereignty over the fourth island, Mayotte (also known as Mahore), but Mayotte is still a dependency of France with the status of a territorial collectivity. Islam is the state religion of Comoros. Copyright © Geographic Guide - Maps of the Africa Countries, Travel and Tourist map guide.